Take a look at the map of your coastal campsite! Using the interactive map of Camping Cala Ginepro, you can see exactly where to find all of the services on offer, and discover where the accommodation units/pitches and the beaches are located. For example, the yellow arrow indicates Cala Ginepro beach, and the blue arrow indicates Sa Mattanosa beach. Bear in mind that the two beaches have a different exposure – as such, in the event of wind, you can choose the more sheltered one for a fantastic day at the seaside! 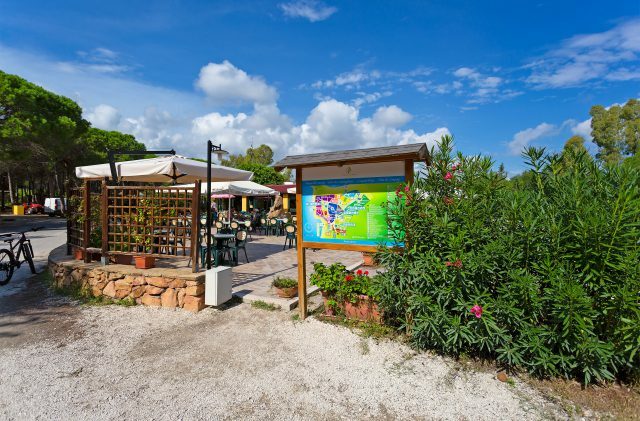 In addition to the wonderful, immaculate natural environment, at Camping Cala Ginepro you will also find a plethora of facilities and amenities designed for you. You can have fun selecting them from the icons below and then discovering them on the interactive map! Soc. Coop. Sa Curcurica a R.L. You can receive more information by reading here.